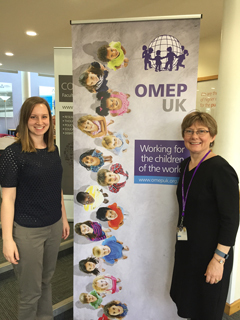 Bronwyn Fees, associate dean and professor in the College of Human Ecology, and Haley Anderson, recent master's degree recipient, presented "Viability of Online Professional Development (PD) for Early Educators: Initial study" in a parallel session on May 6 at the OMEP European Conference in Canterbury, England. Fees has served as treasurer and membership chair of OMEP-USA, an international, nongovernmental and nonprofit organization with Consultative Status at the United Nations and UNESCO. At the College of Human Ecology, Fees is the associate dean for academic affairs and a professor in the School of Family Studies and Human Services. Her areas of specialization include early childhood education and child development. Offering students the opportunity to be exposed to educational conferences and presentation opportunities, regional, national and international, is a priority for Fees. Anderson completed her undergraduate degree at Kansas State in early childhood education and is a program assistant for Kansas Child Care Training Opportunities Inc. She earned her master's degree in early childhood education in May 2016. Anderson is interested in global perspectives on early education and building this awareness in pre-service teacher education and professional development. The OMEP European Conference highlighted the place of the child in 21st century society and a professional development for practicing early childhood educators. Research findings by Fees and Anderson strongly suggested that ease of access to ever-changing and developing models of education is essential for early educators. In a survey of more than 8,000 early educators, professionals self-reported high satisfaction with professional development offered online as well as revealed they made specific changes in their practice as a consequence of training. Through an international incentive grant from the Office of International Programs, Fees and Anderson engaged with students, faculty and administration at Canterbury Christ Church University to explore the potential of a student exchange in the early childhood program. There is distinct interest by both universities to bring international perspectives to their respective programs and to analyze organizations and policies related to early childhood education. Administration of and curriculum at K-State's Hoeflin Stone House Early Childhood Education Center is of particular interest.